A bespoke commission for an internal window measuring 800 x 800mm. The design took several weeks to include a range of features from the customer's holiday photos, and included the customer's input throughout. The picture of the far RHS shows the design in it's 'rough-cut' stage, awaiting the cleaning of rough edges to fit. 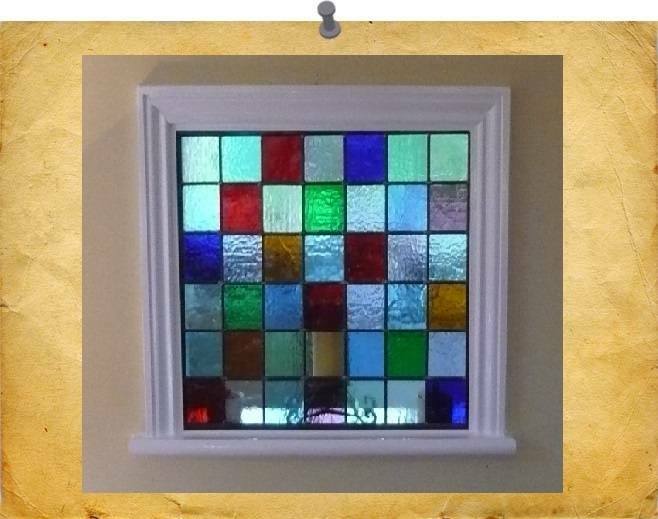 The central picture shows the completed window installed in-situ in the customer's home. A very satisfied customer indeed ! A bespoke commission for Two Suns Fisheries based on Sheppey. The commission required the replication of their business card image in stained glass, depicting two suns reflecting on the sea. A mixture of blue textured glasses for the sea, inferno glass for the suns and wispy blue/pink glass for the sunset sky. Bespoke birthday gift commission. Wispy grey glass with a white glass tusk, with eye & tail in silvered wire. Finished with silvery solder for a shiny effect. Bespoke commission for a Harry Potter fan. Black glass set in clear 'hammered textured glass. Measures 5 x 5 inches. This commission involved creating a surround and border for a customer's existing glass painting of an angel's face. Glass textures and colours chosen by the customer. Measurement is 10 1/2 inches diameter. Made to the design of the original Canterbury Cross (850 A.D.) for a customer in Herne Bay. Colours chosen by the customer and finished with black patina. Measurement is 6 inches diameter. Designed and made for another local customer as a Christmas gift and using a mixture of yellow and light brown wispy glass. Measurment is 8 inches diameter. Again a very satisfied customer ! Designed and made for a local customer, depicting their recently lost chocolate labrador, and using a mixture of brown wispy glass. A very satisfied customer ! A gorgeous corgi, designed and made for a customer from Deal. Finished in a black patina and polished to a high gloss. A replacement panel for Mrs Cowdry of Maidstone. The design was created with ideas & input from the customer, anddepicts a dragonfly hovering over a waterlily, surrounded by bulrushes. The panel measures 760 x 360mm. A beautiful dachshund, designed for a Walderslade couple, to match their own real-life doggie ! Measurements are 9 x 5 inches. A commission undertaken for a Whitstable customer. Two replacement panels for a front door of a victorian house, using a nautical theme in keeping with the seaside location. Both panels measure 3' high by 10" wide and were constructed using the tradional lead came method, with all individual glass panes sealed with leaded light cement to make the panels weather-proof. Completed for the Canterbury branch of the RBL, as a presentation gift for the outgoing branch president. A stunning icon - the RBL poppy of rich cherry red glass, set in a surround of clear textured glass. Finished with black patina then polished to a high gloss. Completed for Mrs Still of Brompton, this was a special commission of poppies and a cornflower, for Rememberance Sunday. The picture was designed to Mrs Still's own requirements in order to hang over an existing glass door panel. The images show the finished work once completed and also in situ. Completed for Mrs Bonard of Whitstable, this was a design selected from our web site and made to specific dimensions for inclusion in a door. Colours were selected by the customer. This commission was completed for Mrs Day of Dorking Surrey. The picture was designed to Mrs Day's specific dimensions and requirements to fit an existing doorway. The specific colours evolved with customer input during the various stages. The image shows the design in the 'rough-cut' stage . This is a commission completed for Miss Phelan of Whitstable. The overall picture was designed to Miss Phelan's requirements and made to specific dimesions to fit an existing doorway. The picture is made up of three seperate picture panels using the copper-foil method and framed in lead came for strength. The first image shows the design under construction and the other shows the completed picture shortly before collection. This is a commission completed for Mr Bowers of Great Chart. He required a replacement window for his kitchen door. He selected a design from our web site, and made to his exact measurements. The first picture is of the completed window still on my workbench and the other two show the window once installed. A very satisfied customer ! This is a commission completed for Mr Marshall, of Broadstairs, for a glass hatchway between kitchen and dining room. 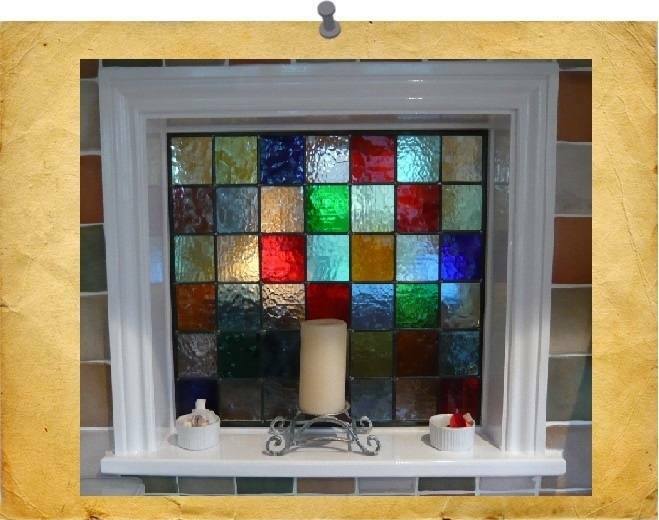 The piece was created with 42 squares of Antique Cathedral glass, placing colours at random. The piece measured roughly 22 ½ inches wide by 18 ½ inches high. The first picture demonstrates construction and the other picture shows the finished panel after installation. This is a commission involving a repair to a copper-foiled glass diamond picture for Miss Wells of Gillingham. The picture had suffered damage and some of the original glass border was broken. The work involved completely dismantling the original work, cutting a new glass border and re-constructing the picture. The first picture shows the damaged item, the second picture shows the repair underway and the final picture shows the completed work. Once again a very satisfied customer !